A centurion was a professional officer of the Roman army who commanded groups of centuries of around 80 men. 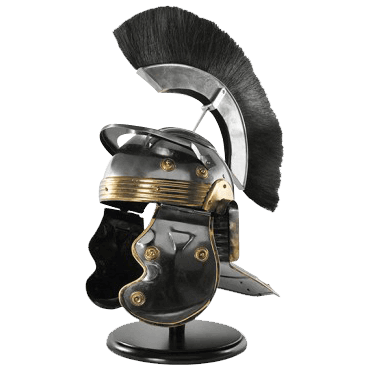 The Roman Centurion Helmet with Black Plume is a superb replica of a helmet that would have been worn by one of these leaders. This helmet is made of a dark stainless steel that contrasts beautifully with the brass accents. Cheek flaps are mounted on hinges and an extension provides the back of the neck with protection as well. The tall crest is mounted at the top of the helmet and features a black plume. 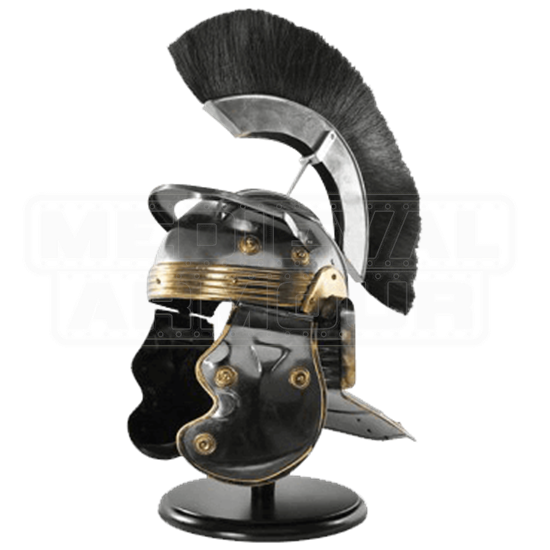 The centurion was a prominent figure on the battlefield, and you will have the same intimidating effect when you wear this Roman Centurion Helmet with Black Plume.